There are not that many strategy video games set in the Ancient Chariot period: while players can emulate Rommel, Montgomery, Napoleon and Wellington in hundreds of games (many of them published by Slitherine! ), the Assyrian, Babylonian and ancient Egyptian generals did not have the same attention.This is about to change since Rise of Persia, the new DLC of Field of Glory, is set in the period of the Mesopotamian wars when the first empires built by man in the cradle of civilisation collided to control the great rivers, like the Euphrates, Tigris or Nile. What is Field of Glory? If you're a fan of strategy games and you've never tried it, FOG II deserves your attention. Born as a table wargame, a first digital version of FOG arrived on PC in 2009. Given the massive success among fans all over the world, in 2016 Slitherine published Field of Glory II, with updated rules aligned with the latest version of the tabletop rules and improved graphics close to the real gaming table experience, in which armies of painted miniatures clash for victory. FOG II original game is focused on the period of Republican Rome and its enemies. The subsequent DLCs have added Imperial Rome period, the subsequent fall of the Empire sparking the Dark Age, and then back in History to the rise of the Achaemenid Persian Empire. Now, with Rise of Persia, FOG II travels further back in time to let you relive the fights of the remotest antiquity when the war chariots were absolute masters of the battlefield. Features The backbone of the titanic army of the King of Persia was the Sparabara infantry. The first rows were armed for close combat, while behind them sheltered masses of archers who threw their arrows at the enemy, protected by the shields of the front soldiers. In FOG II this is simulated by a line of armoured infantrymen and one of archers: you will choose whether to use the Sparabara as a shooting unit and to hit the enemies from a distance, or in close combat with its deadly charge. Features Assyrian battle Chariots were the ancestors of modern tanks. They towered in battle, and their sight was enough to throw in despair the enemies who knew well their shattering charge. 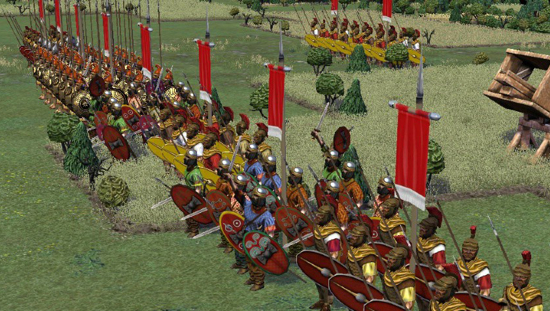 Soldiers armed with spears and bows were present on the platform of the chariot, so you can "soften" the opposing units with a pair of arrow volleys, and then charge the enemy line already disrupted by your shooting. Features In the Rise of Persia period, the horse becomes more and more important on the battlefield, and eventually will replace both the chariots and the camel-backed troops. But in our battles the camels have not yet disappeared: the ancients knew the fearful effect that the camel casts on horses, and used them to disrupt the opposing mounted lines. However, pay attention: the same effect applies to your own horses! Rise of Persia will be available on PC from 27th September!